After our trek to Tulay na Bato Falls in Siniloan on the last week of September, we had another adrenaline urge that prompted us to go waterfall-chasing again last Monday. We were also trying to make the most of a very suitable weather – it was cloudy but not rainy – before the next typhoon or monsoon rains come visiting again. Reserving the other waterfalls in Siniloan for some other time we set our sights instead on Bukal Falls in Majayjay, another town in Laguna. 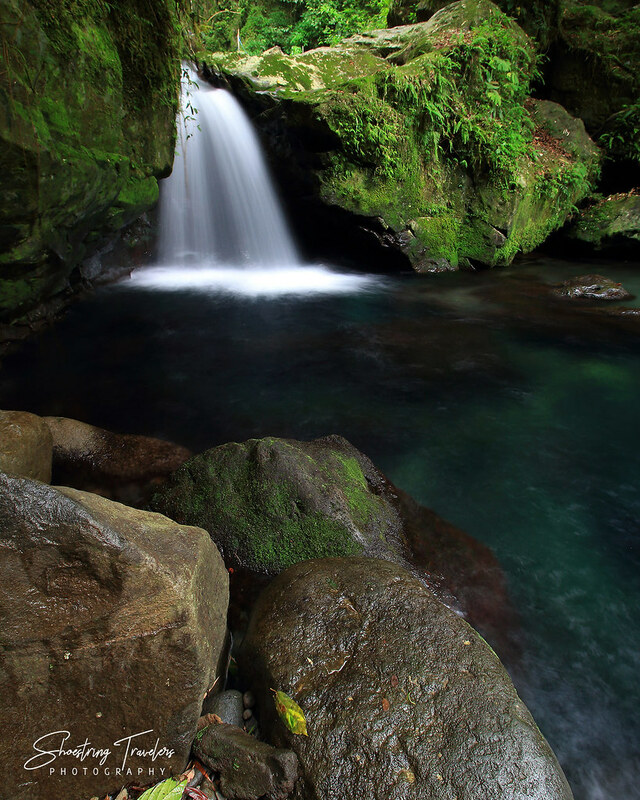 By now many travelers are aware that the province of Laguna is home to dozens of waterfalls. Majayjay town at the foot of Mt, Banahaw is however known for only two (although there could be more hidden in the forests leading to Mt. Banahaw). Taytay Falls used to be the better known and more-visited until recently but Bukal Falls has caught the fancy of travelers in recent years. Getting to the jump-off point to Bukal was relatively easy as we were able to drive all the way to the Bukal Barangay Hall in Majayjay where visitors are required to register and be provided with a guide. And then it was a short drive to a parking lot where the trail to the waterfalls starts. We’ve heard the trek here is relatively easy, with most of the trail cleared and even paved. The trail was indeed paved, even though it was a bit narrow. But we were somewhat surprised that it was sloping slightly upwards almost the whole first part of the hike. Plants and flowers along the trail made for a good distraction, however. There were also vegetables and fruits grown in the fields just off the trail. The sloping trail ends near a store selling snacks and drinks that is used for pit stops. From the store the trail begins its descent to Bukal Falls. It’s a longer descent than Tulay na Bato’s and much steeper in some sections but the trail is paved, not overgrown with shrubs and even provided with handrails. When we began crossing a bamboo bridge over a stream, our guide Andy said Bukal Falls is just beyond the first group of small cascades in the river. A few more winding ascents and we were there, gazing at the crystal-clear and turquoise-colored water of Bukal Falls’ catch basin. Even though we’ve seen it several times in photos online, we couldn’t help but be amazed at the color and clarity of the water. Something seemed to be amiss though when we set our gaze up at the grass-covered cliffs surrounding part of the turquoise pool. Why there was no waterfall at all! More amused than disappointed (we’ve seen this phenomenon already in several photos) we turned to Andy who mentioned that the main falls at Bukal only come out when it had been raining heavily. And since it was rather dry the previous days, even though it was the rainy season, this was more or less not unusual. 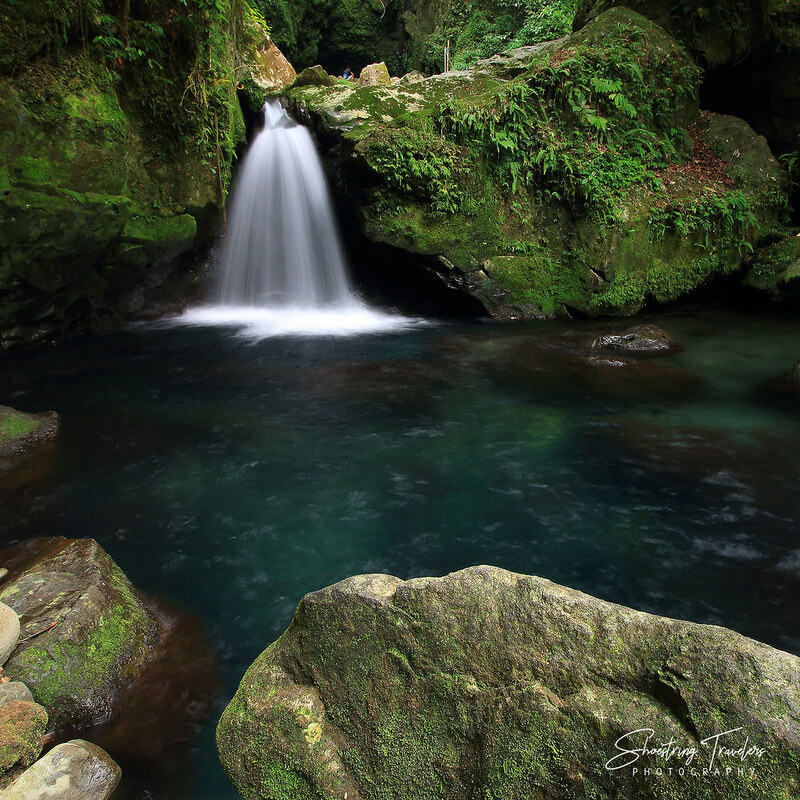 Bukal Falls’ catch basin (with grotto) – but where’s the waterfall?! There were at least 3 other small groups of visitors when we arrived and we only observed two individuals who tried to bath in the main pool. They were out of there in a flash. The water, as we had expected, was freezing cold. But we really weren’t looking forward to a swim here. 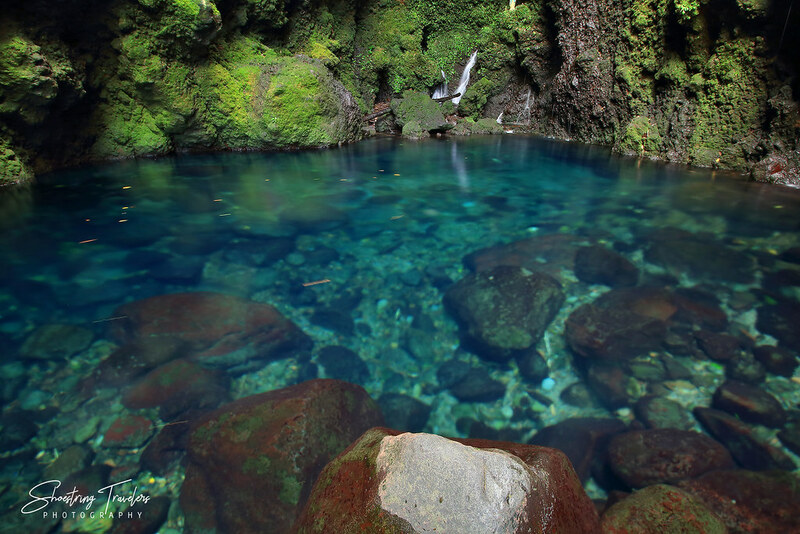 We feasted our eyes instead on the main turquoise-colored pool, the smaller cascades downstream and the moss-covered boulders, all surrounded by a pristine forest. Leo had to wade in almost waist-deep water to get off some of these shots but the water felt more soothing than freezing cold. It would be a different story, however, if we tried diving into the water. After an hour or so of enjoying the sights and basking in the tranquility of nature’s surroundings it was time to go. The trek up the steep slopes was taxing on our legs and lungs but thankfully Andy helped us with our packs and some of the camera gear. In the end this middle-aged couple enjoyed this hike (and the scenery) so much we’re planning to do another one – weather permitting – very soon. 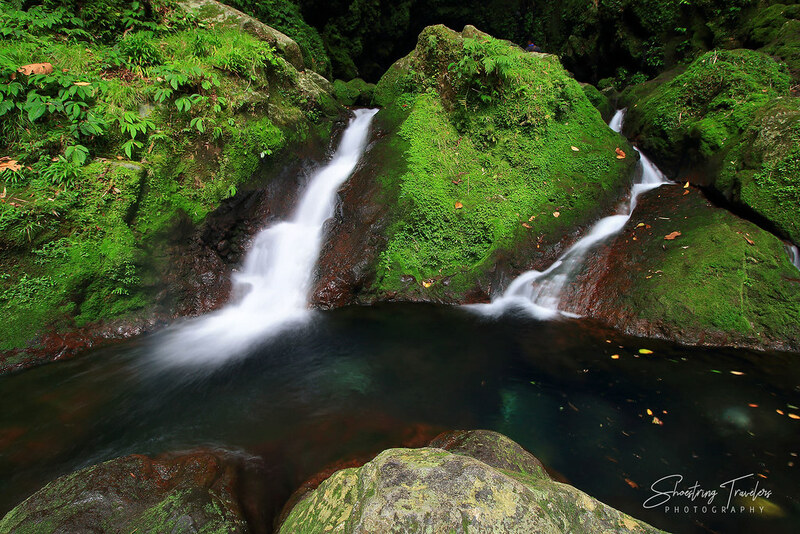 There are two ways to get to Bukal Falls. 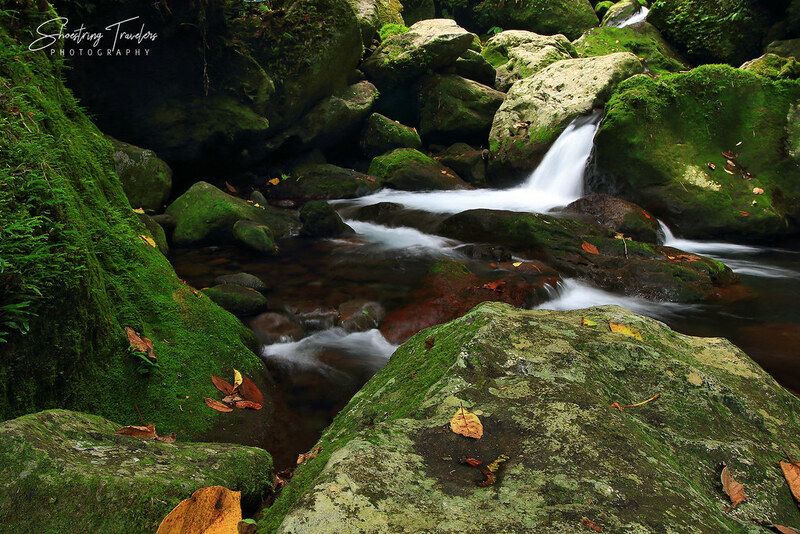 One is via a trail that starts from Liliw town (the locals here have another name for Bukal Falls – Kilangin Falls) but that would take about two hours. The trail we took starts just after the Bukal Barangay Hall and, depending on your pace, can take about 30-45 minutes. Commuting to Bukal Barangay Hall: From Metro Manila take a bus bound for Santa Cruz, Laguna (there are Sta. Cruz-bound buses at the stations in Cubao and Buendia). At Santa Cruz, ride a trike to the public market where you can get on jeepneys bound for Majayjay. At Majayjay ride a trike for the Bukal Barangay Hall. To Bukal Barangay Hall via Private Vehicle: Bukal Barangay Hall is on both Waze and Google Maps so the drive there is pretty much straightforward. From our residence in Taguig, Metro Manila it was about a 2.5 hour drive. 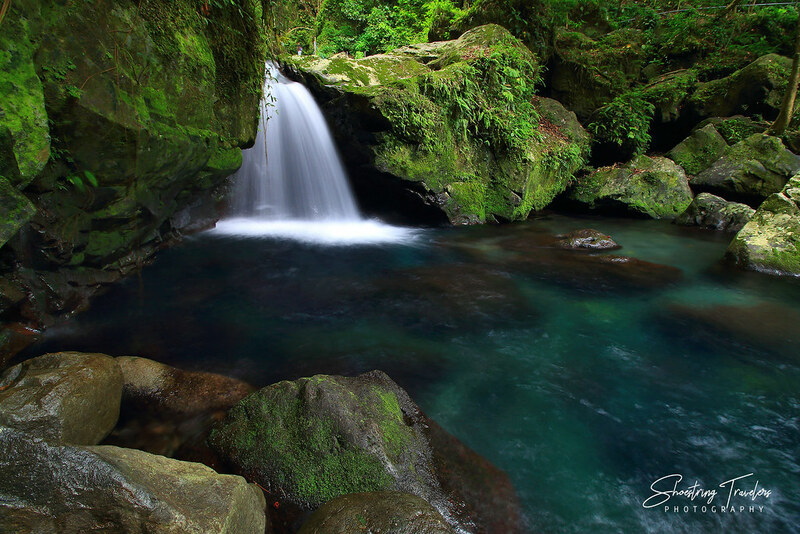 Posted in Laguna, Travel PhilippinesTagged Bukal Falls, hiking, Laguna, Majayjay, nature, waterfallBookmark the permalink.